Now, your dog or cat gets the immune support they need to stay in tip top health. 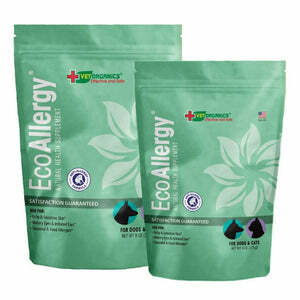 Made with the best, all-natural ingredients, EcoImmune™ is the answer if your pet is fighting infection, dealing with allergies, or suffering from a chronic health problem. Simply add this powerful booster to your dog or cat’s food each day. That’s why we created EcoImmune, a powerful, all-natural supplement that helps your pet stay at the pinnacle of health. Now, you can stop stressing, and give your best buddy the support they need to return to the energetic, happy pet you love. This easy-to-use supplement helps your dog or cat resist illness, deal with allergies, or recuperate from skin conditions, mange, kennel cough, or respiratory issues. It also supports digestive issues, such as feline or canine inflammatory bowel disease and gastroenteritis, and a long list of autoimmune and metabolic disorders. We believe your pet deserves only the very best. That’s why EcoImmune is packed with a powerful assortment of immune-boosting ingredients, including Chicken Liver Powder, Cod Liver, Echinacea Purpurea Herb, Proprietary Mushroom Extract Blend, Proprietary Antioxidant Blend, and more. Your pet is a member of your family, and like any loved one, you want your dog or cat to be in good health for years to come. With EcoImmune, you can rest easy knowing your pet has the support they need to thrive. NOTE: EcoImmune should only be used on pets 12 weeks and older - we do not recommend this product for puppies/kitties younger than 12 weeks. Order EcoImmune today, and we’ll have your package wrapped up and on its way! 100% natural or naturally derived ingredients that assist your dog’s or cat’s immune response. Includes echinacea, magnesium ascorbate, pantethine, and other natural immune boosters to improve your pet’s ability to fight disease before it happens and recover faster from existing ailments. EcoImmune™ Immune Support & Booster Supplement contains only natural and naturally derived ingredients, which means that your pet is not ingesting any harmful chemicals and artificial preservatives. Our concentrated formula is quickly absorbed. Simply add half a scoop per 10 pounds of body weight to your pet’s food each day. Liver can provide your dog with protein, fat and vitamin A, all of which help him stay healthy. Liver is also a good source of copper, iron, niacin, phosphorus and zinc. Regulating the immune system, boosting those that are suppressed and calming overactive immune systems for pets with allergies or autoimmune diseases. Aiding in mental development of puppies, and improving cognitive function in older dogs. Promoting weight loss in overweight animals. Magnesium increases oxygen delivery to muscle tissue which allows it to increase both endurance and relaxation. Low magnesium makes nerve endings hypersensitive and magnesium helps fight it. Echinacea improves the function of your dog’s immune system. Some studies have shown that taking Echinacea can speed up recovery time from common illnesses such as colds and flu. Safety precautions: Consult with your vet about using Echinacea if your dog suffers from an autoimmune disorder. Keep in mind that Echinacea may decrease the effectiveness of immunosuppressants. Consider avoiding use in dogs who are highly susceptible to allergic reactions. Consider avoiding use in pets who are breastfeeding or lactating. Notify the vet of other drugs/substances your dog is taking. Antioxidants support immune function, and reduce the risk of chronic degenerative conditions such as cancer, arthritis, and heart disease. They help neutralise the free radicals which cause excessive oxidation in our body. Pantethine is an energy-boosting and metabolic support nutrient. It helps synthesize acetylcholine, an important compound for nerve function and memory. It supports detoxification as well. Zinc can reduce oxidative damage. Regarding mood, zinc has a calming effect on the brain and deficiencies can lead to agitation and mood swings. 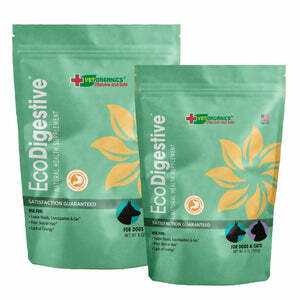 Apply EcoImmune daily to your dog’s or cat’s food for better digestion, nutrient absorption, and immune function. Measure 1/2 scoop of EcoImmune Supplement for every 10 lbs. of body weight of your dog or cat. Note: While your pet’s digestive system adjusts to the micronutrients, his body may go through an adjustment phase. If you notice undesired changes in your dog or cat’s elimination or appetite, we recommend introducing the supplement more slowly, in smaller amounts, to build up to the full dosage. Please consult your veterinarian for extended use with autoimmune disorders.